Many college students are pursuing thoughtful ways to measure the “value” of education. (With the cost of earning a bachelor’s degree averaging $25,143 per year at a private college and $6,585 at a public college or university according to reports released by the College Board, it is no wonder why many students take their college search seriously.) After all, no one wants to make significant investment of their time and money only to struggle finding jobs in that field and paying off debts for twenty years. For the purpose of helping students make proper choices in their educations, a new tool has been designed. 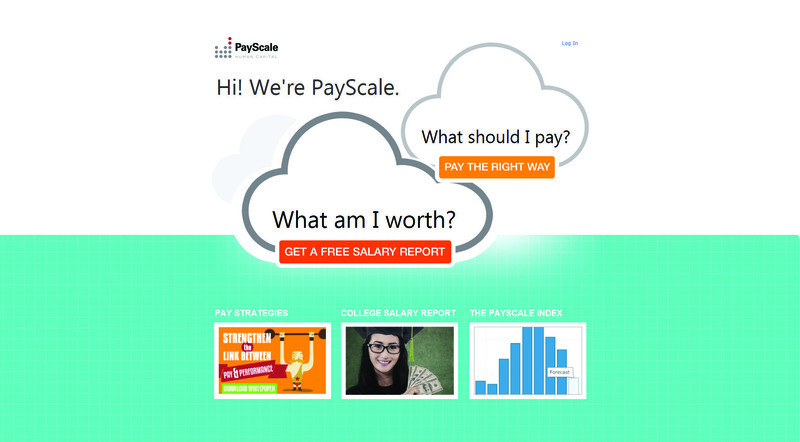 The website’s name is PayScale, and it may revolutionize how people measure college success. PayScale.com is an online survey that asks questions about salary, experience and the workplace. Individuals searching online for salary comparison information complete the salary survey in order to get a free personalized PayScale salary report. The report can help find an exact pay range for your job, career planning, and which cities would be easiest on your wallet. Established in 2000, the company anonymously compares individuals to other people with similar attributes such as job title, location, company size, and education. With data from over 1.4 million college alumni, College Salary Report helps users compare salary data for over 1,000 US colleges & 120 majors. It ranks institutions by the average earnings of their graduates. The website also calculates and ranks the average return on investment for a college and the percentage of graduates holding prestigious jobs. Whether trying to figure out which school to attend, what you should major in, or what career to pursue after you graduate, the College Salary Report will help you make smart decisions about your educational choices. While students should not let the size of a paycheck force them into a field they are not passionate about, it does not hurt to see which schools and majors have a reputation for providing attractive salaries. No student is guaranteed a high salary or even a job after they finish their undergraduate studies at a specific college. However, PayScale was able to identify certain schools that graduated individuals who went on to earn significantly more through their careers. California’s Harvey Mudd College was found to have the highest alumni mid-career median salary of the 1,016 schools PayScale looked at. According to the report, graduates of the college had a mid-career median salary of $143,000, while the median starting salary was $73,300. The United States Naval Academy at Annapolis, Md. was behind Harvey Mudd College with a mid-career median salary of $131,000. “Salary potential after graduation isn’t the whole equation, but it’s an incredibly important part, and we think there are more ways this data can be utilized,” PayScale’s consumer marketing director Lydia Frank said, in a press release. According to the report, students who focus their studies on petroleum engineering could be setting themselves up for career success, as this major had the highest mid-career median salary of $160,000. Those who majored in actuarial mathematics and nuclear engineering followed, with mid-career median salaries of $120,000 and $117,000, respectively. “Given that the economy isn’t roaring back and student debt continues to spiral out of control, it is imperative that future college students educate themselves on the earnings they can expect after graduation,” said Katie Bardaro, lead economist at PayScale. While students who pursue degrees in these fields may one day receive high salaries, it is important for others to remember that majoring in a specific subject does not guarantee a certain pay range. Bardaro also mentioned: “Jobs are harder and harder to come by, student debt is huge, and the costs of schools are rising faster than inflation. We don’t see this changing anytime soon.” With incredible resources for college students PayScale.com has certainly made an impact on students and employers alike.